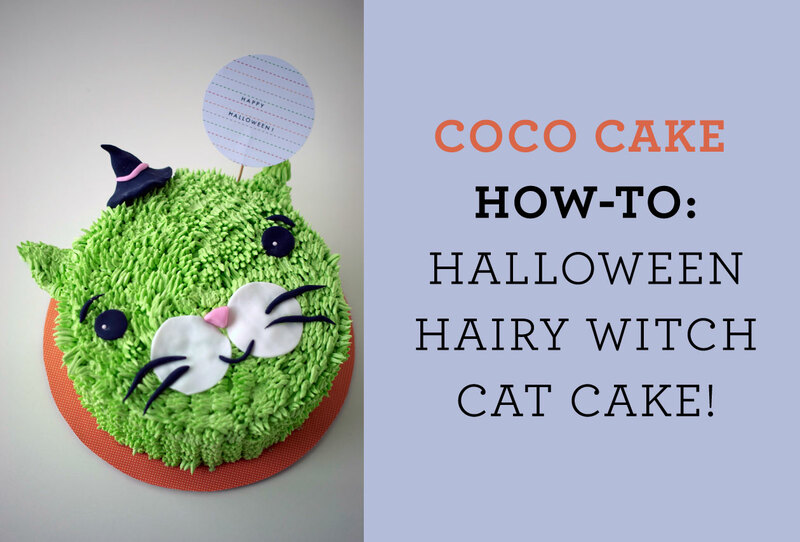 Bake O'Clock Special: Halloween Cake How-To! I know. I'm a weirdo. 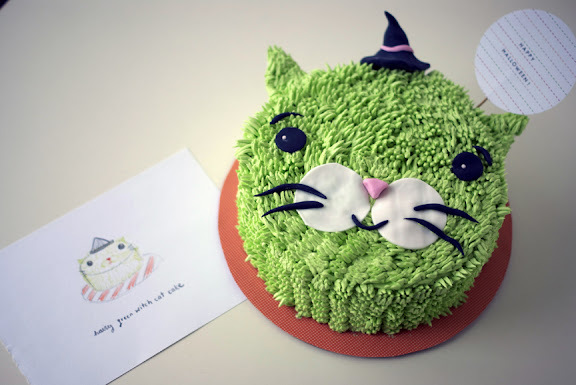 Hairy witch CAT cake? I really don't like the typical Halloweeny type business - orange and black and gory yucky bloody stuff. Why not keep Halloween kind of cute? Kind of hairy? 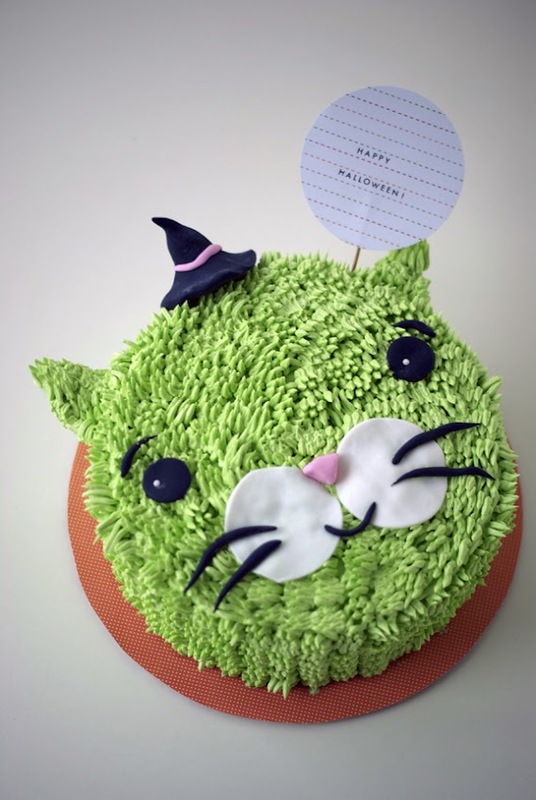 I thought of making a warty-faced witch cake. 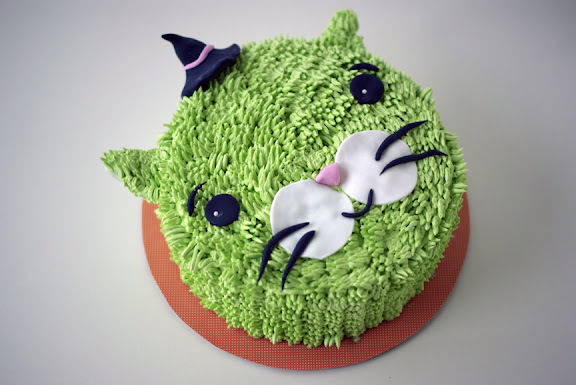 But then I thought, who wants to bite into a witch's big old wart, even if it's in cake form? Instead, why not bite into a cute little fuzzy cat face... Okay... that doesn't make a whole lot of sense either. Anyhoo... I present to you, a Coco Cake how-to! Halloween it up, everyone! 1. Two layers of baked round cake. 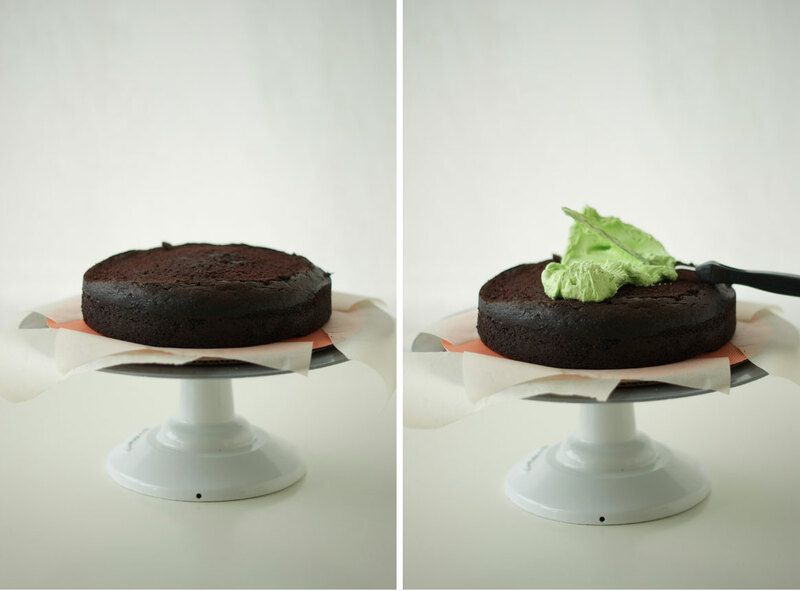 Bake your cake in two round cake pans according to a recipe's instructions, let cool, level the cake with a serrated knife and you're ready to go! I made an 8 inch dark chocolate cake. 2. 4 cups of buttercream. You will need to frost the middle and sides of the cake plus have enough to pipe hair all over it, so 4 cups should cover it. I made vanilla buttercream and tinted it green with a dab of gel colour. 6. Some fondant, for making the face, ears and hat. 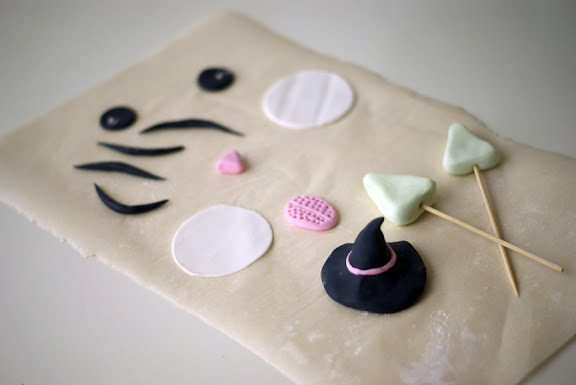 You can buy pre-colored fondant, or buy plain white and buy some gel food coloring to color the fondant. Fondant can be purchased at your local cake supply shop or craft megastore in the cake supply section. 7. 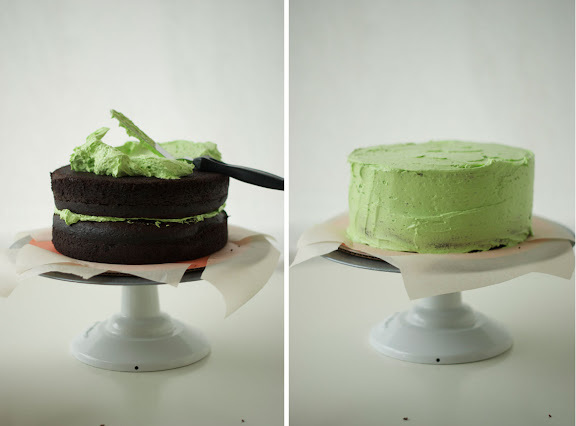 An offset spatula for frosting your cake - not crucial, you can also use a butter knife! Okay! Here we go! 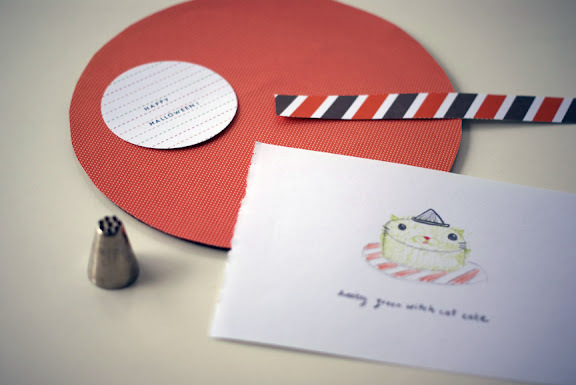 I made a custom cake board by cutting out a piece of polka dot craft paper to the size of a 10 inch round cake board and glued it on top! I also made a custom Happy Halloween circular "flag" which I will tape to a toothpick and plunk into the side of the cake once it's finished. Special piping tip: I call this the "hairy" tip or the "grass" tip. 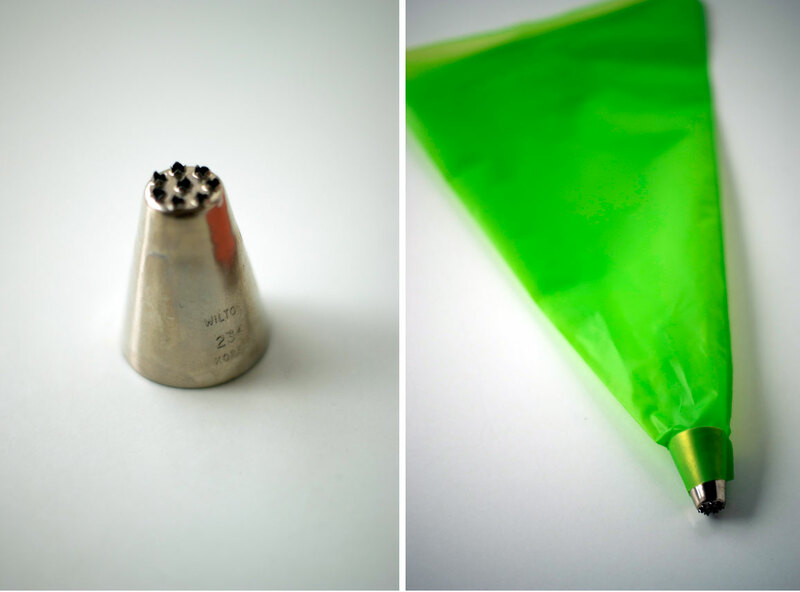 I think it's official name is the multi-opening tip (BORING) ... you can get this at a craft supply megastore in the cake section, or at a cake supply shop! Or, online at a place like Scoop N Save in Canada, or Bake It Pretty in the US of A! 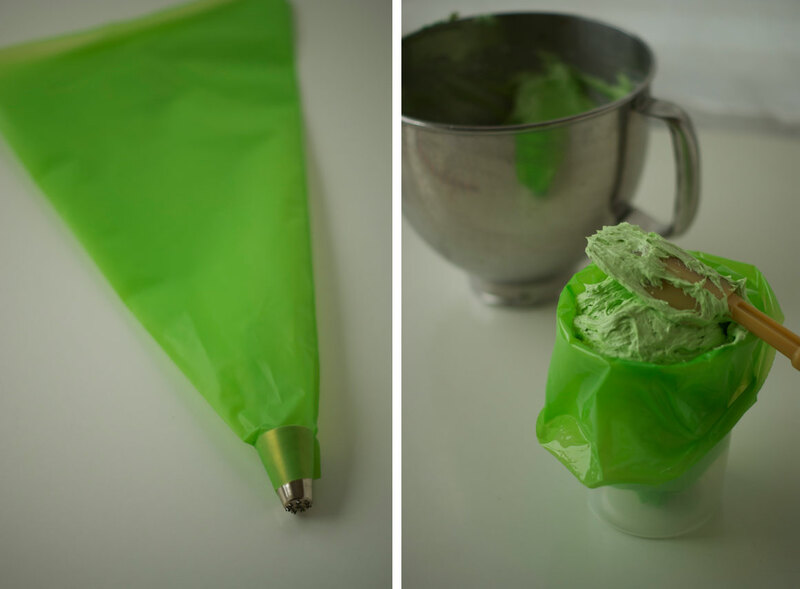 I bought those horrid green disposable piping bags in bulk, but you can also buy them through the above sources. I need to get some normal piping bags. Those green ones are so ugly for photos. A drawing! I always do a little sketcheroo of my cakes. Heehee! A drawing is great as you can refer to it as you're working. Or you can freestyle it. Up to you. 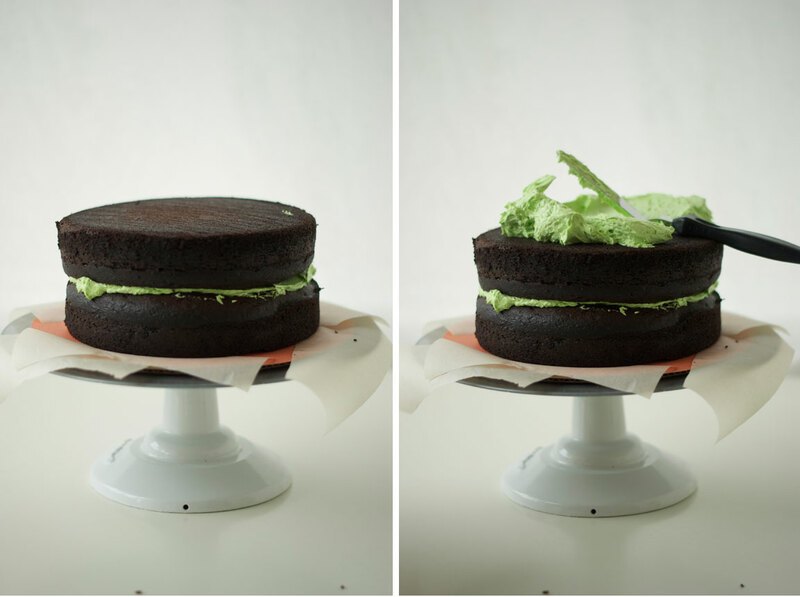 Place one layer of your cake on your cake board. 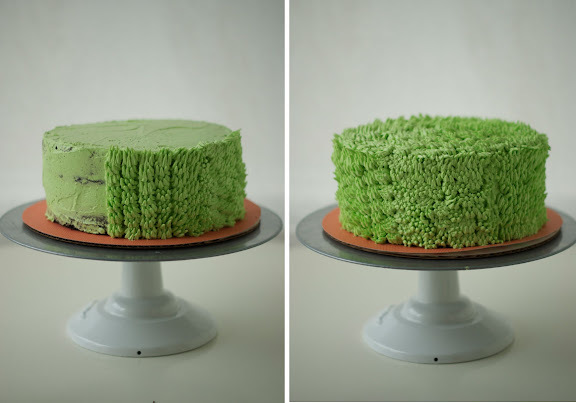 I always blob some buttercream underneath to stick it to the cake board and hold it in place when I frost. You can also tuck little pieces of parchment paper or wax paper just under the cake so the cake board doesn't get all buttercreamed out. Frost the top of the cake layer evenly, as this will be the cake's filling. Place the second cake layer on top, serrated side down, lightly press down into the buttercream. Now, starting at the top of the second layer, frost away! 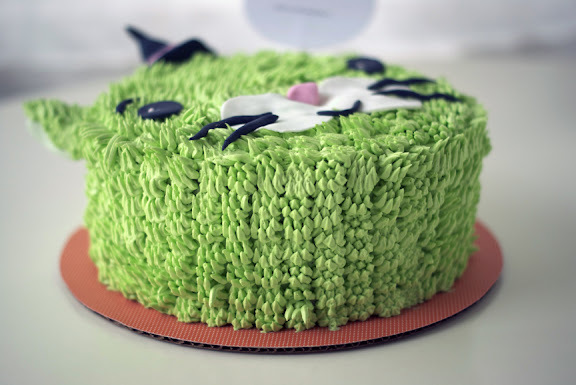 Frost the entire cake. This is called the "crumb coat", where you trap in all those pesky crumbs with buttercream. Usually I chill the cake in the fridge at this point to set the crumb coat and then apply another layer of buttercream so it looks all smooth and non-crumby. However, since we're making this into a hairy cat, you won't see the crumbs in the final product so I didn't bother with frosting it further. Snip the tip off of your piping bag and place the multi-opening tip in. Fill 'er up, sir! I place the bag in a yogurt container for easy-filling. Twist the top of the bag and start squeezing out the hairy buttercream times! Remove the parchment paper strips. Now, with the piping bag, squeeze out some hair and tart from the bottom and pipe a line of hairiness up to the top. You can practice piping first on a plate until you get the hang of it if you wish. Go all the way around the cake in this same way... then pipe the top of the cake, too! 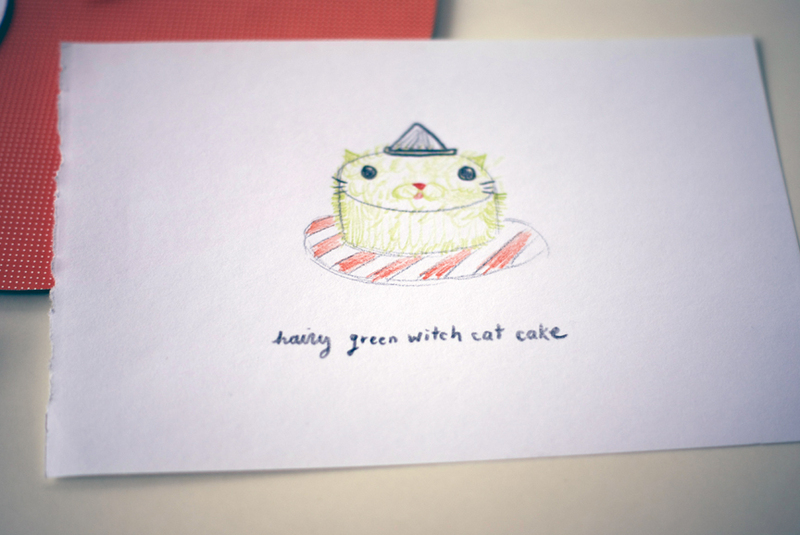 HAIRY GREEN WITCH CAT CAKE! Side view! Pretty hairy, eh. Hope you all enjoyed the cake tutorial! Haha. Well, the name may be weird, but it's a super adorable cake! @maria, thanks so much - i'm heading over to check out the caramel apples! wow. green hair is weird. But it's totally handsome! Im in love! that is so creative and cute. Lovely creation. THAT IS SO ADORBS! need. to. make. it. now. @carol - thanks so much! Do the fondant details ever melt with the butter cream underneath?